I have always had pets. I started with a goldfish, moved on to a hamster, and now have a cat called Fluffy. 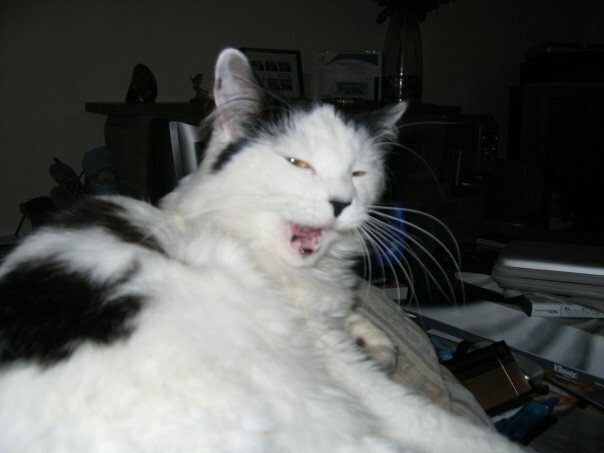 Fluffy has been with us for around seven years now, and is, in my completely biased opinion, the best cat ever. She is very affectionate, loves being stroked and cuddled, and spends every evening lying in her basket on the sofa behind me as I write. I have had several episodes of mental illness – mostly depression – while Fluffy has been around, and I have found her an enormous comfort to me. Stroking her fur makes me feel more calm, collected, and more peaceful. I’m not saying she cures me, but she does make me feel better. I think this is in part because we have an uncomplicated relationship. I understand what she does – she’ll purr if I stroke her, she’ll cry if she wants food, and if she ever scratches me it is because I have scared her, not out of malice. I can make her happy easily, far more easily than I can make another human, and she doesn’t confuse me the way humans do. Particularly when I am unwell I lack insight into how my moods and behaviour affect other people. For some reason when I am ill I tend to think I don’t affect others, because they do not really care for me. So I think that when I am depressed, when I am suicidal, when all I can do is sit and stare, that it doesn’t make any difference to my friends. Now, when well, I can see that other people are concerned about me, they worry, they feel sad that I am suffering, and so on. But I have found depression makes me very insular, as though I cannot see past the boundaries of myself and see what others see, or understand how they feel. With Fluffy I don’t need to worry about that, I don’t get confused about what she says/thinks, she is just my lovely cat and I can make her happy – whereas I can’t understand how to make my friends happy when I’m ill, because they want me to be less depressed and that is out of my power to change. I also find that if I am feeling anxious or worried about something, that sitting quietly with the cat, listening to her purring and stroking her makes me feel far more calm. It is as though it puts it in perspective – I may be worrying about making a fool of myself, doing a bad job etc but Fluffy loves me no matter what. I’m sure lots of people have the same relationship with their pets, and find them a wonderful comfort when they are ill, or lonely, when something bad happens and so on. I have also found Fluffy seems to sense when I am feeling at my worst – she comes to me, when I am self-harming or have just finished, and rubs her face against mine, as though she knows how bad I am feeling and wants to help. Words can’t really express how much she means to me, and I thank God for her presence. She also has been the one thing stopping me from serious self-harm or suicide on many occasions. It is odd really, that I can be feeling so absolutely awful that I want to die – but I wouldn’t leave Fluffy without food or water or someone to care for her. It has been her presence, her need of me that has stopped me when the idea of loved ones being hurt by my death has lost its meaning. My depression can convince me that no one loves me, that they would be better off without me and so on, but I know my cat needs me, and I couldn’t bear her to be hungry and alone. I am not the only one who finds pets helpful when ill – reading on the internet I came across this study, about animal therapy in mental hospitals. They compared patients with a wide range of disorders having animal therapy and a therapeutic recreation session. The patients were asked to fill in a questionnaire about their anxiety after each session. The study found that patients with mood disorders felt less anxious after either animal therapy or therapeutic recreation, but that psychotic patients felt considerably less anxious after meeting a therapy dog. They also found that lots of other disorders, including dissociative disorders were helped by the animal. The study also notes that, in other studies, animals have been shown to reduce levels of depression and psychosis, calming patients and relaxing them. They also discovered that hard-to-reach isolated patients who wouldn’t normally take part in voluntary therapies did so when a therapy animal was offered. Elderly patients with dementia had lower heart rates and patients with Alzheimers were found to socialise more. So it seems that the medico-psychiatric world realises that animals can be good for your mental health! Unfortunately I have never been offered a therapy dog in hospital, but maybe that will change. So, I find my Fluffy a tremendous asset to my mental health, quite aside from her gorgeousness in her own right! I have friends who find their dogs/cats/birds wonderful for them as well. She is my lovely little thing and I would be a lot poorer without her. I thank God for his wonderful creation of the animals in the world, our lives wouldn’t be anywhere near as good without them. It’s nice to “meet” you, via Giant Fossilised Armadillo. Fluffy is lovely and I agree, pets are wonderful therapy. Our cat made the 50 mile journey to see our daughter in hospital more than once, and everyone loved one of the fellow patient’s dogs.